I was inspired to make these paper puzzles after reading the post by S.B. of, S.B. 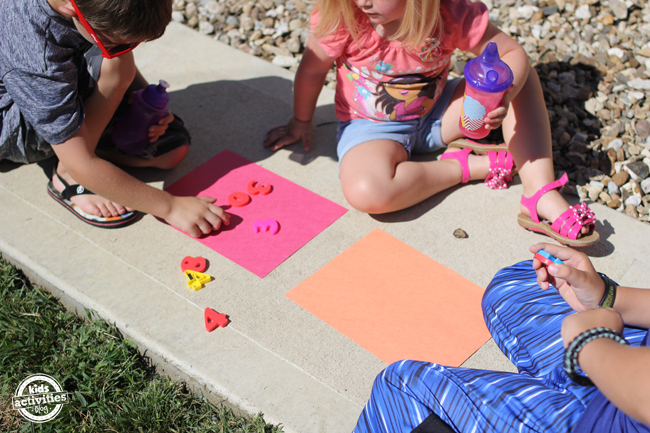 Creatively, she took advantage of the summer sun to create a mat where her kids practiced letter identification. We adapted it to create a few puzzles for my youngest. We created one with alphabet and letter magnets and another with different shaped blocks from around the house. It was so fun! How to make a bleached puzzle? You need construction paper. The cheaper the better. I used high quality art paper the first time and it didn’t bleach well. A sunny day, being in Texas, we have lots of those! I love how the block shapes helped my toddler work on early geometry skills. It was fun watching her rotate the blocks to try and replicate the image. Hope your kids enjoy puzzle making! Thanks to Nicole of Activity Mom for sharing this post with us! Previous Post: « Girl Starts Crying When She Finds Out She’s Going To Be A Big Sister! What a super cool idea! Now, what can I use this with. I currently only have the Leap Frog letters……. This is a great idea. We just saw an episode of Sid the Science Kid about sunscreen. They painted pictures on the paper with sunscreen and then left it in the sun. Target has construction paper on sale this week. Now I’m all set! Love this idea! Ticia, you can cut out letters from a cardboard cereal box. We did that this summer for another activity. This looks so cool. 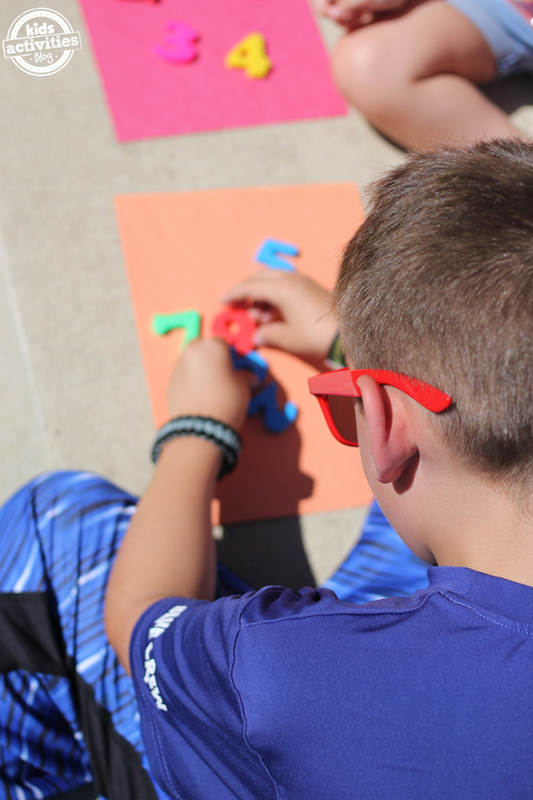 I definitely had the bright sun to do this activity. Thanks, great idea! How long did you leave your paper out to develop? We left put the paper out before lunch time and got it before nap time, so maybe 3 hours at the most. We did it once with higher quality art paper and it didn’t work, but the off-brand paper work marvelously. I liked the results with red paper more than with the other colors (only that puzzle got crumpled during the picture taking process). Hope you have fun sun-bleaching! I’m going to try using sunscreen next after the comments left by one of the other participants. This is such a truly great idea! Thrifty as can be- and could not be simpler. Like literally could not be simpler!! lol. wonderfull idea I will also try this. I bought a banner for the kids, which was also puzzle. I can hardly wait for Santa to come. Ã‰n vettem egy leporellÃ³t a gyerekeknek, amihez jÃ¡rt puzzle is. MÃ¡r alig vÃ¡rjÃ¡k, hogy jÃ¶jjÃ¶n a tÃ©lapÃ³. What a great idea!! I teach our the pre-k at our homeschool co-op and have been looking for something to do for them to work on over the summer and I think this is perfect and easy and wont break our budget!!!!! 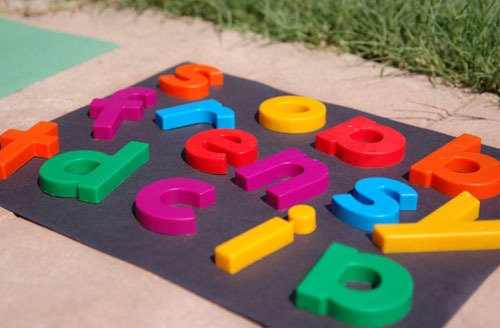 If you don’t happen to have letters, you can get foam bath letters at Toys R Us for cheap! There are also, the small foam type in craft store with the peel and stick backs, leave the peel on and reuse them for something else or use the darkened area as a shadow and stick the letters on offset from the darkened area. Thankyou so much for featuring me in this week’s post! I linked up from another site so hadn’t seen it! I’m really grateful!